"This could have been in the retail game" has become the motto of many a frustrated gamer since the days of the horse armour DLC that was released for Elder Scrolls: Oblivion back in 2006. I use this example because I want to illustrate how far DLC has come since then, and Bethesda's Fallout 3 Operation: Anchorage is a far cry from those early days of plate-wearing ponies. Fallout 3 was certainly not a game that could be accused of short-changing the gamer in the hopes of further profit through DLC later on. As such, the first of 3 planned DLC packs seems more like icing on the cake rather than trying to fill out a thin offering. In Operation: Anchorage (Op:A), you will have the chance to enter a military simulation of the battle for Anchorage, Alaska in the year 2066, before the nukes started dropping. The immediate question that arises is "what makes this feel like Fallout?" You'll be running through a world without radiation, bombed-out buildings or roaming bands of mercenaries. Instead, you'll be fighting against the might of the invading Chinese Army. As a result, the DLC doesn't really have a "Fallout" feel to it. There's very little of the dark humour that the series is known for, and you won't be scrounging for weapons or health kits. Those have been replaced by ammo and health dispensers, frequently found on the battlefield. What is present here is a combat-focused experience. If you spent a lot of the original game skulking around or talking your way out of scenarios, you might find this mission difficult. Op:A does a very good job of rewarding your efforts though, as you'll gain access to new items that are available for use upon completion of the DLC, which should take you around 4 hours. This was the most satisfying aspect of the DLC, and well worth the cost of admission if you plan on spending additional time in the Wasteland after completing Op:A. My one complaint against this offering was a fairly serious bug I encountered with the final adversary. I can't be too specific for fear of ruining it for our readers who haven't picked this up yet. My only advice is to save often just in case you experience this issue. 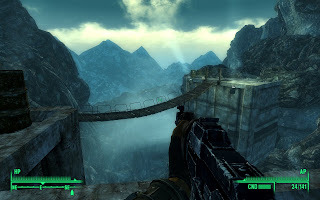 Otherwise, Operation: Anchorage is a solid experience for the Fallout 3 vet and well worth the 800 MS points. OH the humanity of it all.....wish I got Fallout 3 for the 360 now. Nothing is stoping you from buying the 360 version as well, then you can reward Bethesda and MS for their collusion, and you can sell your PS3 version to someone who doesn't care about DLC, or just doesn't know it exists if it doesn't come on the disc to start with. Well, you should pay attention to the gaming media then perhaps? Bethesda announced the exclusive 360 back at E3 in July 2008. If you known this, and had both consoles, you would have got the 360 version.